We would like a product insert to go into a wallet. 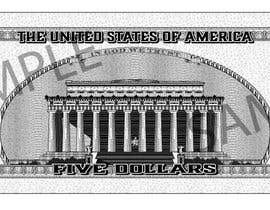 The insert should be sized and designed to look similar to a US $5 bill. Would need to look like money in the wallet, without looking like a counterfeit bill. It would need to be a 2-sided editable file. You will be responsible for the design concept and we will make the final edits. 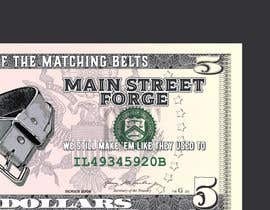 Our brand name is "Main Street Forge". The fonts we use are attached. 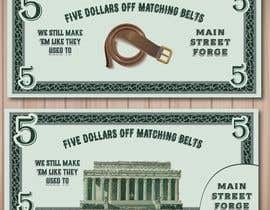 The idea is we want to offer $5 off the matching belts. Links to the belts are below. Our slogan is "We still make 'em like they used to" and that is the overall idea we want to be able to portray with the brand. We partner with small, local craftsman/artisans to make high quality products with the care and the attention to detail that gets lost when things are mass produced. We then take those products from those smaller shops and sell them directly to the consumer via the internet which allows everyone access to high quality goods without paying an astronomical amount and also allows small batch makers to get their products out to the world without having to become online marketing experts. If you have been rejected it is because you did not read the request. it would be nice if you could scan a crisp 5 dollar bill and upload it. Please review the ENTIRE DESCRIPTION. None of these entries have done what was requested. 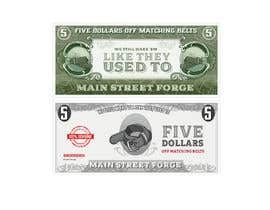 Anyway, I'm still looking for a high quality 5$ bill image to vectorize. Please check my entry #13 , that's my initial entry. I'll submit again once I have a vectorized 5$ bill ready. What's your need tell me in one sentence word. You need logo.